The cabinet on Monday authorized the IDF to increase its military pressure on Hamas - but to avoid escalation of tensions, if possible. As rocket fire from Gaza shows no sign of letting up, the cabinet on Monday authorized the IDF to increase its military pressure on Hamas. The IDF intends to add more troops to the brigades it already has poised on the borders of Gaza, officials said. So far an additional 1,500 reserve troops have been called up, to free up regular soldiers in case of need. 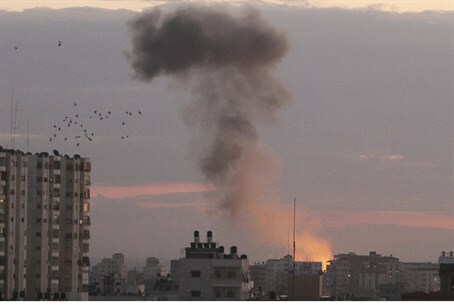 Meanwhile, the Israel Air Force will increase its targeting of terrorist facilities in Gaza, the army said. With that, the government decision said that the aim of the IDF operation was not to enter into a wide-ranging military action against Gaza Arab terrorists, but to ensure quiet in the south. In addition, the IDF is to ensure that rocket fire does not spread to cities other than the ones that Hamas and terror groups have been targeting, mostly in the Gaza border area. In addition, extra batteries of the Iron Dome system will be set up throughout southern Israel, officials said. On Monday, the IDF said that it targeted several terror smuggling tunnels in southern Gaza. The action, the army said, prevented “a steady stream of terrorists into Israel. We recently found a significant terror tunnel leading out of Gaza, which we are gathering intelligence about to prevent further terror attacks and to prevent [the tunnel] from being used [again]," an IDF official said. "We are also investing significantly in gathering our security forces," he added. "Until now we have had two full staffs working on the situation and we are readying ourselves for escalation [with Hamas]." Overnight Sunday, the IAF launched airstrikes against nine terror targets in Gaza.According to the IDF Spokesperson’s Unit, the targets included concealed rocket launchers and terrorist centers in central Gaza. "The IDF is prepared to defend the citizens of Israel from any threat and will continue to act decisively and as long as necessary until quiet is restored,” the statement said, placing the responsibility for the constant rocket fire on the Hamas terrorist group. The airstrikes come several hours after an Israeli airstrike on Gaza killed two terrorists from the Islamic Jihad group. Despite the total collapse of security in the south and the constant threat of rockets on a large civilian population, Prime Minister Binyamin Netanyahu on Sunday indicated he would not order a wide-scale operation in Gaza for the time being. "Experience has proved that at moments like this, we have to act responsibly and with a cool head and not with harsh words and impetuousness," Netanyahu said. "We will do everything in our power to restore peace and security to the south."